Joomla 3.0 – Easy steps on how to install a Component in Joomla. After you download a component file from the Joomla Extension Directory (JED) or any Joomla extension provider, do not unzip the ZIP file. The easiest way to upload and install a Joomla 3.0 component is in ZIP format. Make sure the component you want to install is compatible with Joomla 3.0 otherwise after you install, you will get errors. The component should clearly state if it works with Joomla 3.0. Below are steps to install a component in Joomla 3.0. 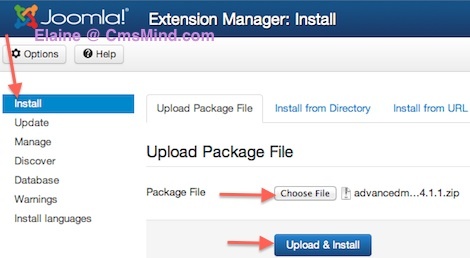 Joomla 3.0 Extension Manager you can install and uninstall new modules, Components, plugins, languages, and more. I’m installing a new component into my Joomla 3.0 website. It’s called the Advanced Module Manager. You will go to the ‘Install’ on the left navigation and choose a file. It’s easiest to upload the Component ZIP file so do NOT unzip the file after you download it from the JED. After you clicked on ‘Upload & Install’, if there were no errors, you will see a success message. If there were errors, you will see them now. Make sure you uploaded and installed a component that is Joomla 3.0 compatible. <Component Name> has been installed successfully. Sorry for choosing such a confusing component to demonstrate installing a component. This component I’m installing is called the ‘Advanced Module Manager’. Hope that helped you, please leave me a comment if you have any questions.